Yorkie® Chunks are delicious chunks of smooth milk chocolate, packed into an easy to share bag so that you can share the Yorkie® taste with your family and friends. Just tear open the bag and share the moment. If you fancy sharing a bag of Yorkie Chunks, we've got you covered. 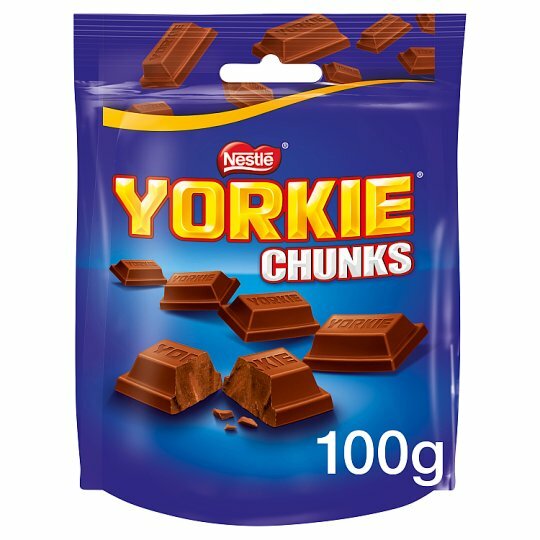 Yorkie® Chunks have no artificial colours*, flavours or preservatives*. Just tasty Yorkie® chocolate! On the next long drive, in the evening or at the office, why not grab a bag to share? Yorkie® chocolate has been proudly made at our factory in York since 1976. Straight-talking and no nonsense, you can trust Yorkie® when you need a tasty chocolate treat that tells it like it is. If you love sharing Yorkie® Chunks, try Yorkie® Raisin & Biscuit bars. The same delicious chunky milk chocolate, with an extra crunch!